Since Valentine' s Day is on February 14th, much of the day here in Wisconsin is celebrated in the midst of snow and cold. So it isn't a surprise to find hearts mixed with snowmen during this special day. 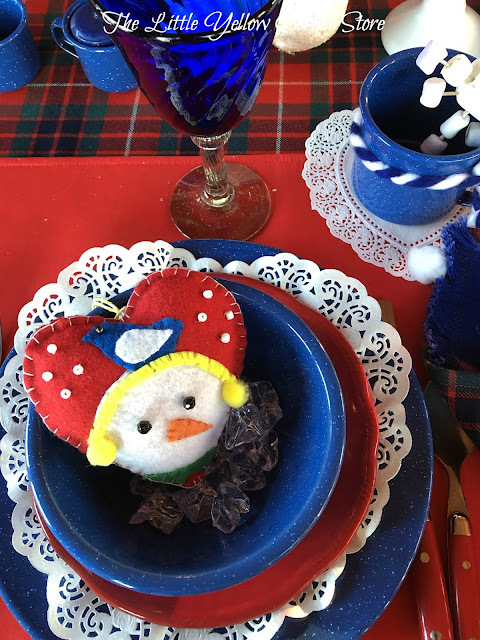 What would the day be without seeing bright red hearts scattered among lovable snowmen table decor. You can really say my "heart" melts for snowmen. How appropriate for Valentine's Day. In addition, when I stop to think that this blog, according to those who comment, are viewed by people all over the world, I am extremely thrilled and honored. I hope that with my creation of blog articles, I can share some love for Valentine's Day and other things throughout the year and that each and every person finds it a pleasure. 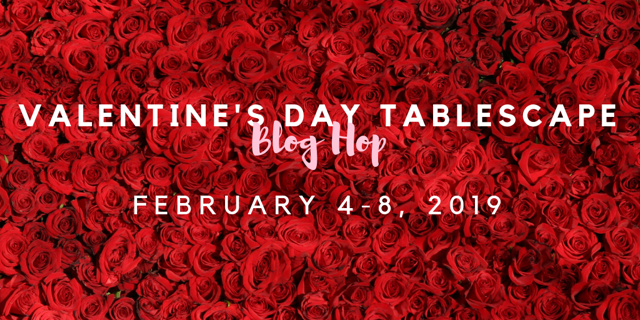 As a way to share these things with others around the world, I am participating in this week's Valentine's Day 2019 Blog Hop hosted by Chloe Crabtree of Celebrate and Decorate. I am one of many tablescape designers who are celebrating the Valentine's Day holiday with unique and festive tablescapes. Please visit the list of blog links below and be encouraged by all of the designers who offer their many talents, creativity and artistic ideas. I was inspired to do a Snowmen and Hearts tablescape for the blog hop after coming across this lovable and whimsical snowmen cookie jar. 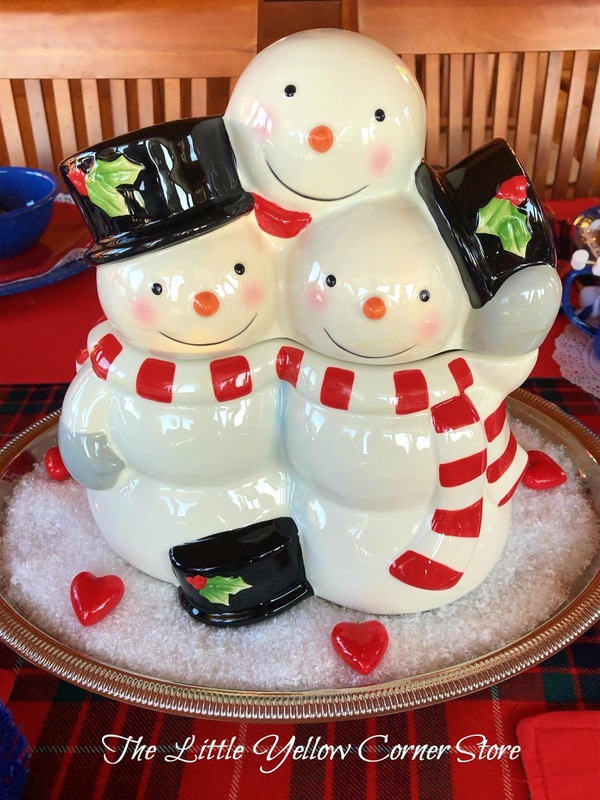 Who cannot get weak at the knees over this sweet trio of hugging smiling snowmen? 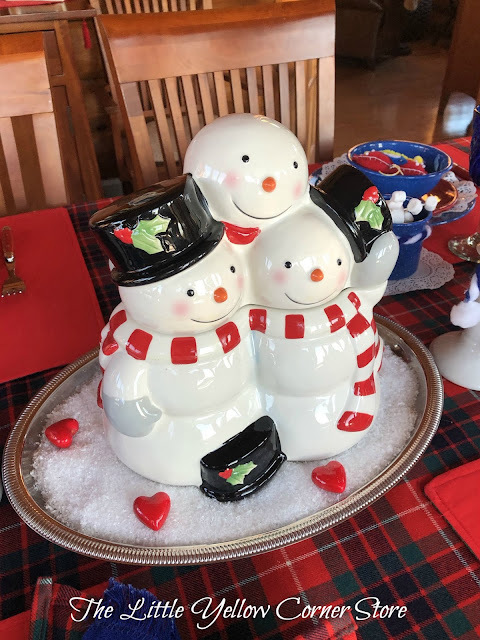 Placed on a tray full of faux snow and surrounded by mounds of snowballs, it makes for a centerpiece which captures any one's attention and heart. The bright red, blue and green tartan tablecloth and napkins were sewn from fabric I was lucky to come across at a fabric store. I love the colors when mixed with the cobalt blue napkins, glassware and enamelware. 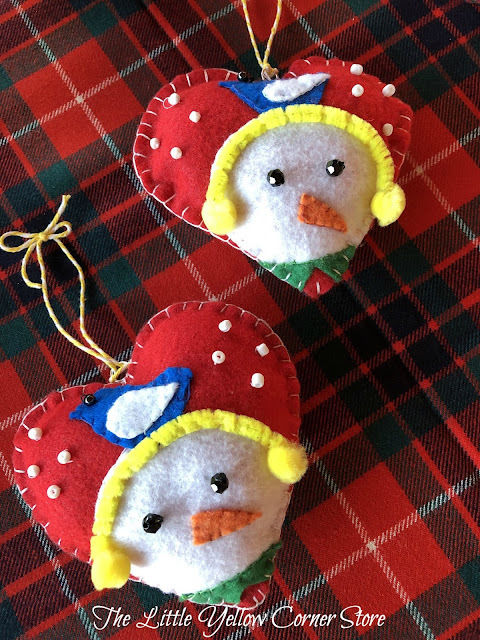 I couldn't resist using up some of my felt for some heart-shaped snowmen ornaments complete with snow and a winter bluebird perched on its head. White paper hearts, along with the heart-shaped ornaments and red hearts and ice vase fillers spreads the message that Valentine's Day is near. Can't wait to mix up some rich and creamy hot chocolate for this soft and sweet marshmallow snowflake. 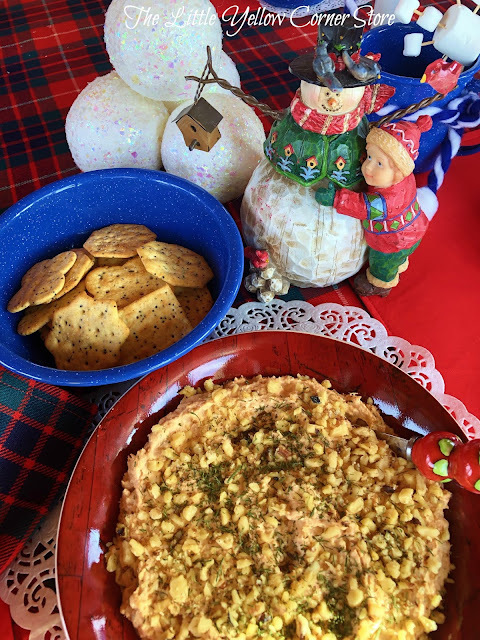 A Creole Flavored Smoked Fish Spread with poppyseed crackers as a tasty appetizer begins the get together on a cold winter afternoon. You can find this recipe at Taste of Home- Smoked Salmon Cheese Spread. 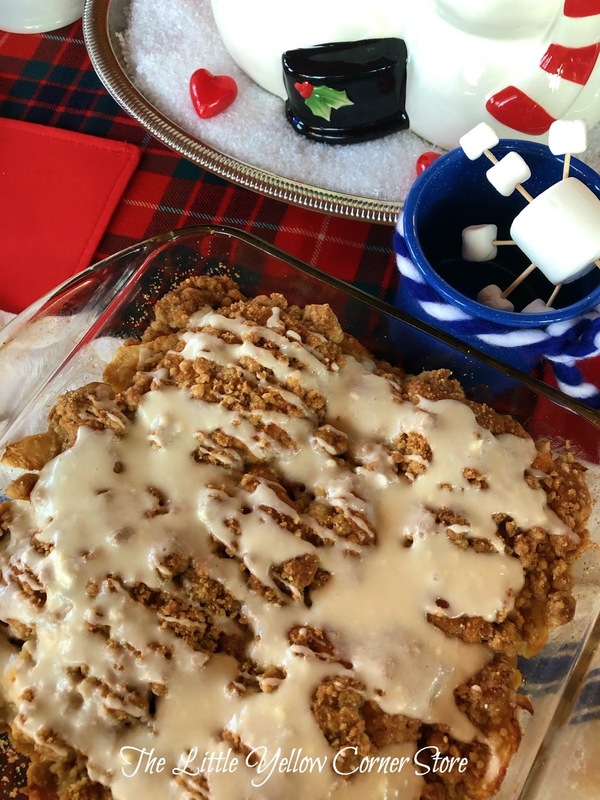 A freshly baked Apple Crumb Coffeecake tops off a cozy and snowy day. 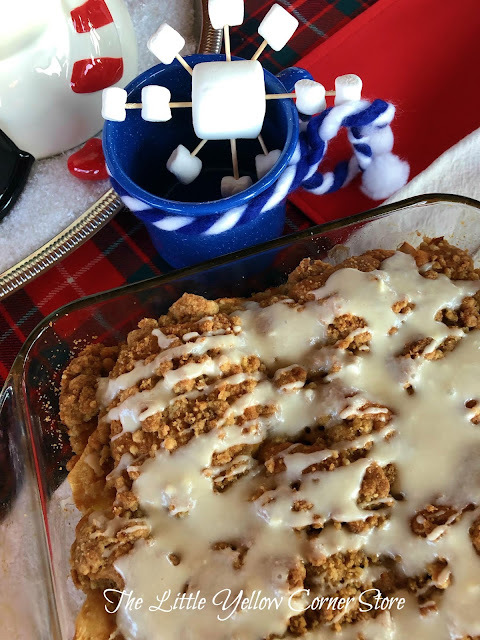 To make this recipe, just visit Oh My Goodness-Chocolate Desserts - Cinnamon Apple Crumb Cake. Yum......finally some hot chocolate, whipped cream and heart sprinkles with marshmallow snowflakes. Perfect for the nine inches of snow we are expecting today. 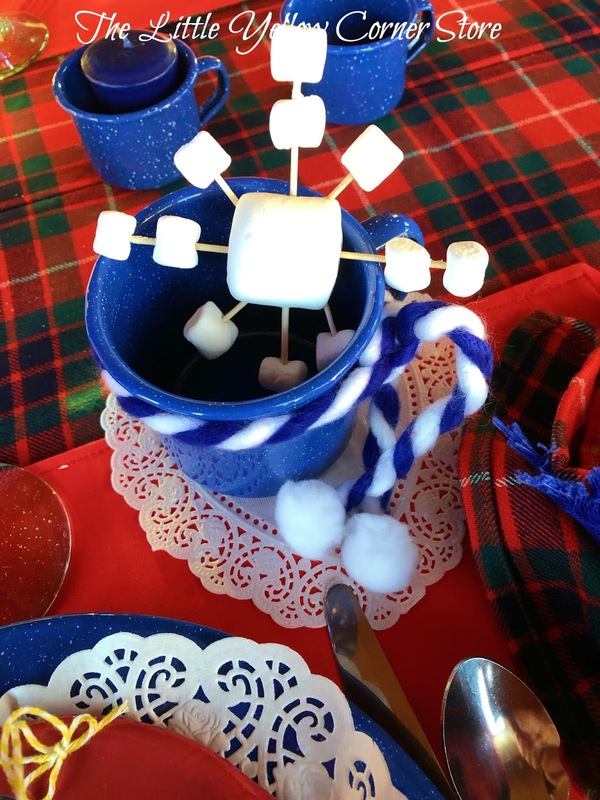 So come out of the snow, sit back with a cup of hot cocoa complete with a marshmallow snowflake and enjoy browsing through the blog links below. Each designer invites you to comment and welcomes you as a new friend. Thank you Carol. Snowmen are loved by all. Happy Valentine's Day. Marsha, what an unexpected and creative spin on Valentine's Day! Love the blue punches of color with the red, it reminds me of the blue skies of winter. 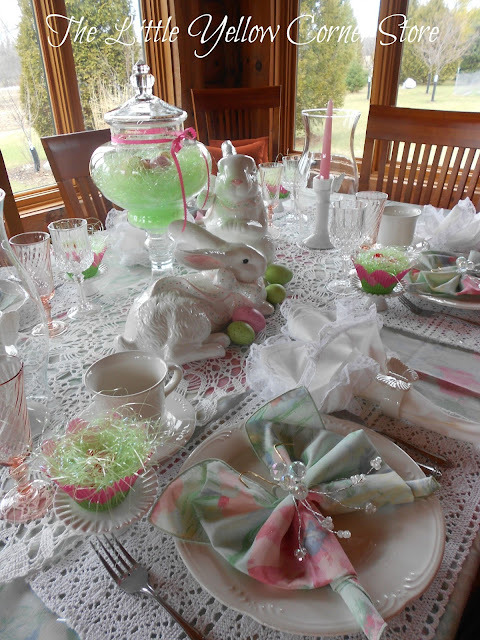 Very original to have found the fabric you wanted to created your tablecloth and napkins. 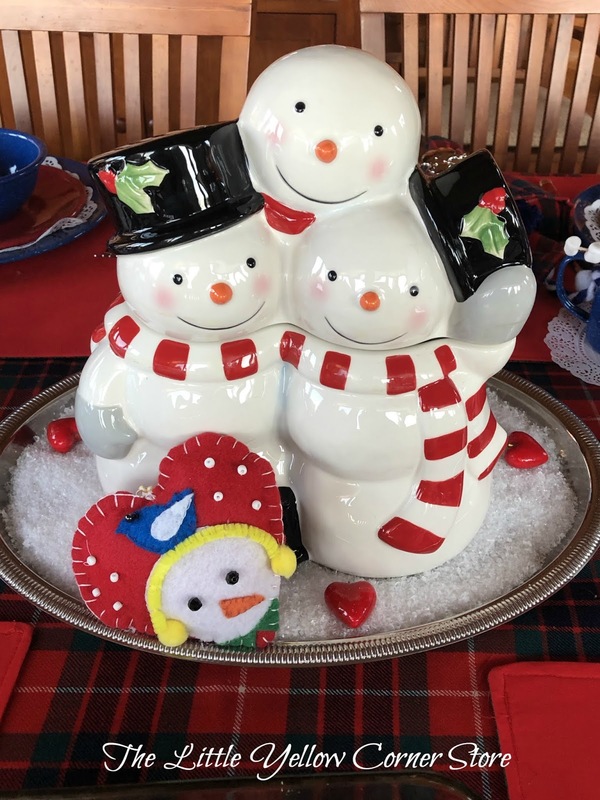 The snowmen hearts are the cutest, and so is that marshmallow snowflake! I'm pinning that smoked salmon dip recipe - yum! 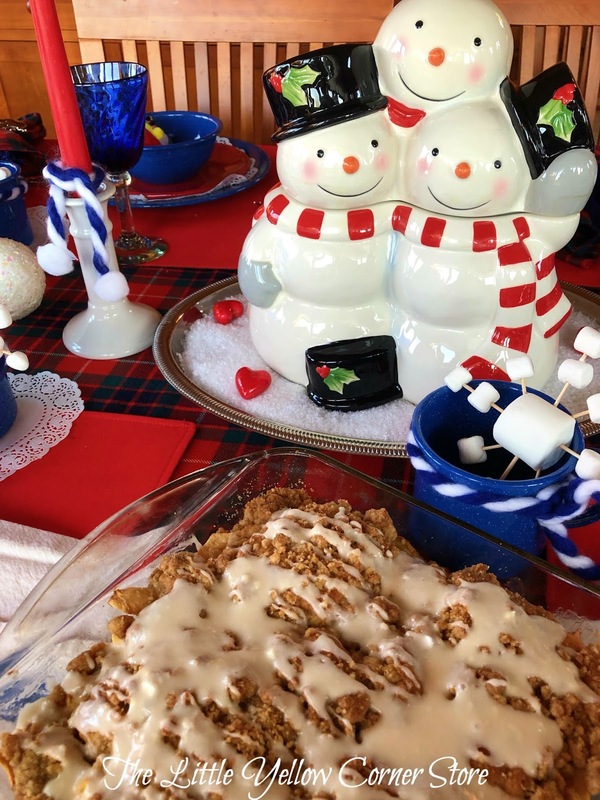 Happy to see your Wisconsin winter spirit on display in this blog hop. I hope you're enjoying the thaw that we're now having after last week's deep freeze. Thank you Rita. I appreciate your kind comments and encouragement to get through this difficult winter. I am glad to see the spell of warmer temperatures which are now melting the deep freeze in Wisconsin. However, it won't be for long. The cold temps are soon to return. It means more hot chocolate with snowflake marshmallows! Happy Valentine's Day. This is an adorable take on our Valentines theme!! 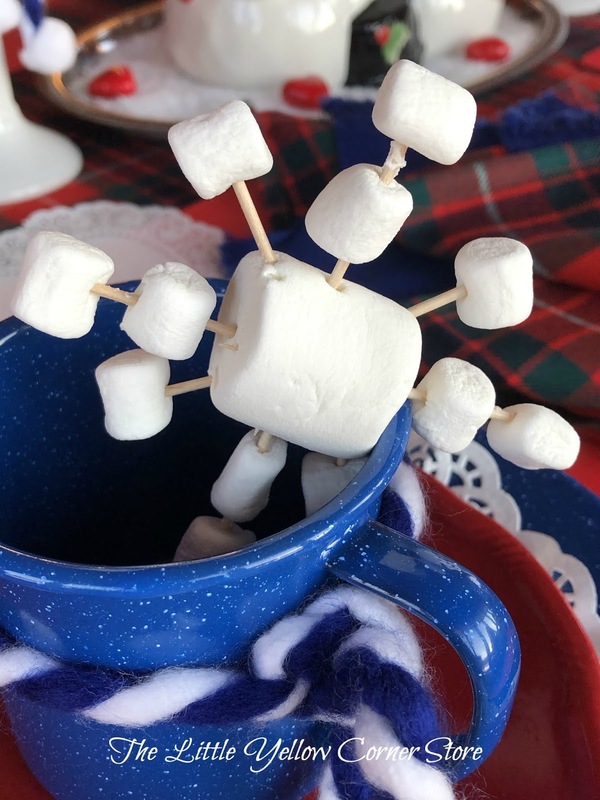 Your table is soooo cute, just loving your marshmallow snowflake!!!! Perfect table for the weather we have been having!!! Love it all! Thank you Ann. The tablescape certainly fit in with all of the snow we received in this area of Wisconsin. I could have easily made a snowman outside too if it wasn't for the -50 degree windchill. Stay warm and Happy Valentine's Day. Thank you Mary. I certainly look forward to all of your floral centerpiece postings to help me get through a cold spell. It is always a pleasure to be blog hopping with you too. Your two puppies are always a joy to see and I enjoy your great creativity in and around your potting shed. Can't wait for Spring in the Frozen Tundra of Wisconsin. Happy Valentine's Day. What an adorable idea mixing snowmen and valentine’s hearts! Your table is the cutest. Love that marshmallow snowflake and your centerpiece with the snowmen and hearts! Very creative and original! Hi Liz, I hope you stayed warm during the north's bitterly cold temperatures. Soon we will be sharing Spring ideas too. I am glad you liked the snowmen theme. Happy Valentine's Day! 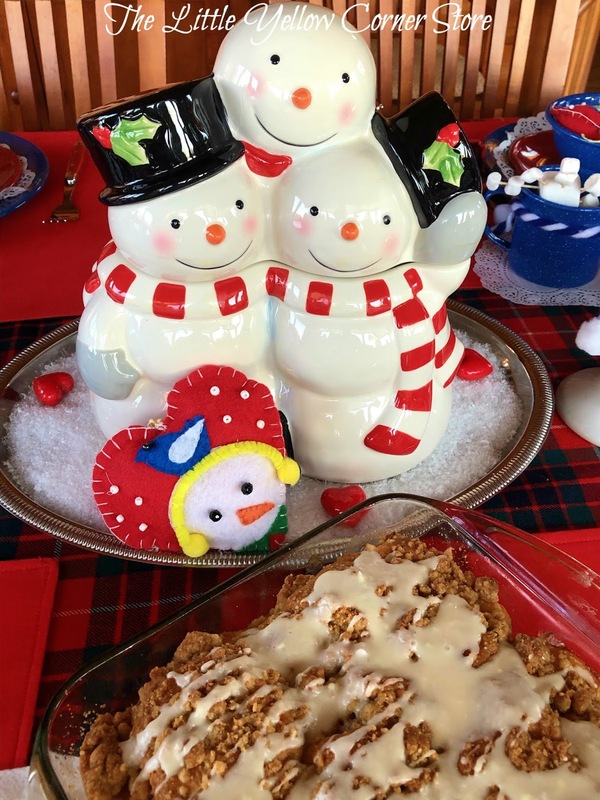 Your sweet snowman table warmed my heart! I recently set a winter bar combining snowman tableware with black and white everyday elements. Loved how you pulled out the red to tie in with Valentines and mixed it with cobalt blue. Your ornaments are wonderful, a great table accent and favor to take home. 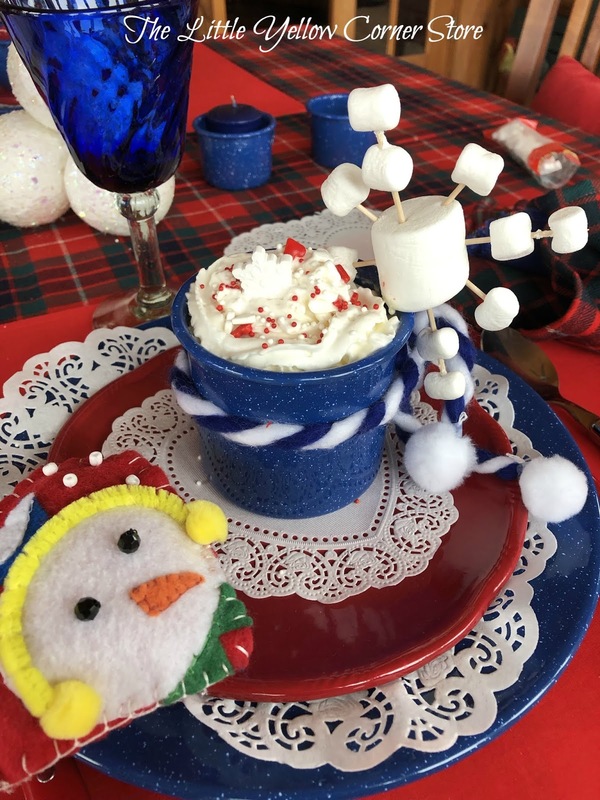 My favorite part is how you embellished the mugs and thise marshmallow snowflakes! Pinned. Thank you Debbee. I really needed a perky table in the midst of this arctic cold. I guess I will be drinking a lot more hot chocolate since it is not over. As a comforting thought, I am already thinking of a Spring table. I hope you are some where warm and without the deep freeze. Enjoy the special Valentine's Day. What a sweet fun take on Valentine's Day! I can see why you fell for the trio of smiling snowmen, that are adorable! Your felt heart snowmen are so creative and cute, and the marshmallow snowflakes are wonderful! Wishing you a cozy Valentine's Day full of comforting hot chocolate! Thank you Jenna. The hot chocolate was a comfort on these subzero days in Wisconsin and the snowmen cookie jar kept me smiling. 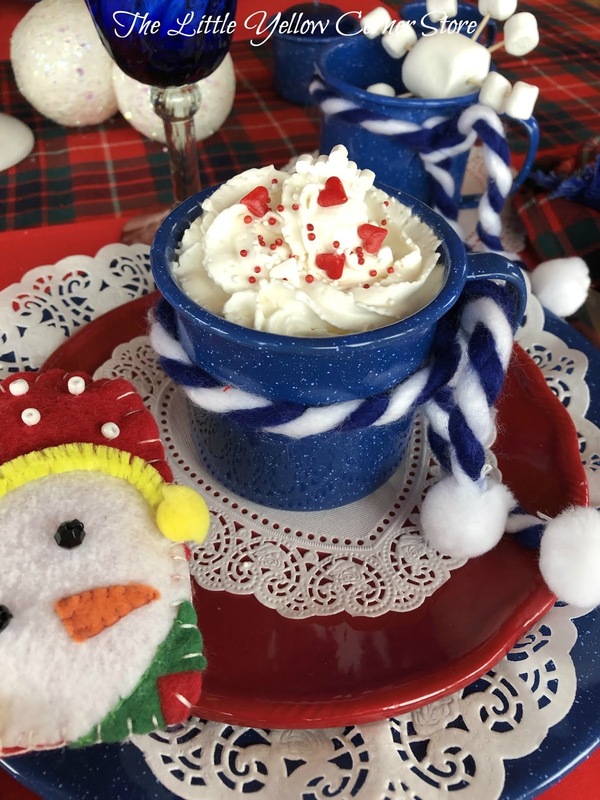 Love the little snowmen and the hot chocolate is one of my favorite cold weather drinks. Your table is so cute and happy. It is always a pleasure to blog hop with you. Happy Valentine's Day, Kari. Thank you for your visit and comment. Hopefully, we will see winter end and we will be celebrating Spring soon. 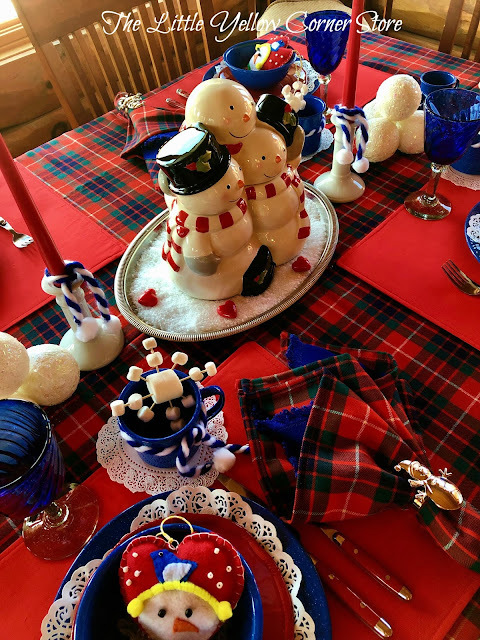 Whether it is winter or summer themed tablescapes, it is always a pleasure to blog hop with you too. Many happy wishes to you. Thank you Cecilia. The combination of snowmen and Valentines is definitely popular in the cold conditions of Wisconsin. I am glad you enjoyed it. Best wishes and stay warm. Happy Valentine's Day! Love, Love, Love the plaid! Thank you. I am crazy over plaids, checks and polka dots. Thank you for visiting. Very creative Marsha. Your snowmen are so sweet. Love the idea of mixing. The snowflakes are so sweet. Who would of thought of marshmallow snowflakes? The yummy dessert plus the hot cocoa sound perfect for a cold day. Happy Valentine's Day. Thank you Linda. 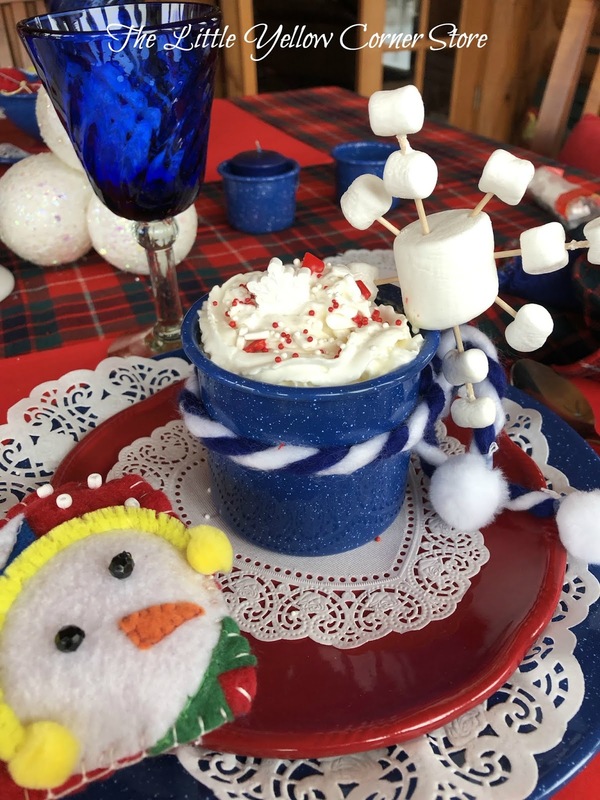 If we have too much more of this very cold weather, I will need to have a lot more hot chocolate with snowflake marshmallows. Way too much allowed on my diet. Thank you for your visit and lovely comment. Until the winter ends....keep smiling like the snowmen. I even created some little snowman Valentine cards. One is a snowmama hugging her snowbaby. The other is a snow-couple cuddling. Something about snow people cuddling... I couldn't help myself! :) You can find them here: https://mamasbrush.wordpress.com/2019/01/30/snowman-valentines-free-printables/. So adorable. I love your snowmen cards. You are so talented. I love anything which is found to be hugging...snowmen, animals, people. Thank you for your comment and visit to The Little Yellow Corner Store. Marsha, this is such a fun and creative take on Valentine’s Day! I love the tartan with the blue, it is so festive and happy. Your ornaments are so sweet and the marshmallow snowflakes are just perfect. It is always a pleasure to blog hop with you! Fun and festive is what I hope this tablescape would convey, especially on these cold winter days. Need to warm up the spirit somehow, right? Always can use more happiness during the remainder of this long winter. Thank you and it is a pleasure to be blog hopping with you. Happy Valentine's Day. So many cute details! I love snowpeople and put mine out for January and into February. I just packed them away when I brought out my valentine things. Thanks for sharing. Stay warm! I am ready to think Spring too, but for now the smiles of my snowmen will take me through these wintry days ahead. I hope you have a wonderful Valentine's Day too. How fun to admit that February is still the middle of Winter by including the sweet snowmen and snowflakes in your Valentine's table. Your unique styling is why I love these hops, seeing how each of us interprets the holiday or theme onto a table. Those marshmallow snowflakes are too, too cute! Your table certainly looks cozy and welcoming! Thanks for once again sharing your talents and joining in another hop! Thank you Chloe. We need to send you a special thank you for organizing these fun blog hops. Without your wonderful talents, we wouldn't be able to share our own gifts. I agree, it is always such a pleasure to witness all of the creativity of other designers. I appreciate participating with other artistic ladies. Thank you for welcoming me into this wonderful group. 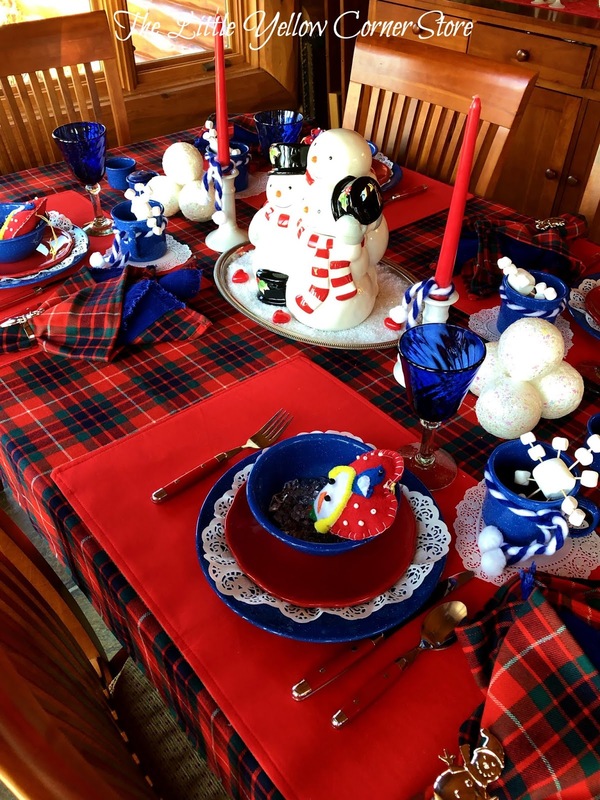 Well, I've never thought of using snowmen in a Valentine's tablescape, but it works beautifully. Love seeing a different look. Stay warm and cuddle on Valentine's Day with your hot chocolate ~ it looks delicious. Marsha, I just love your winter themed Valentines Tablescape. 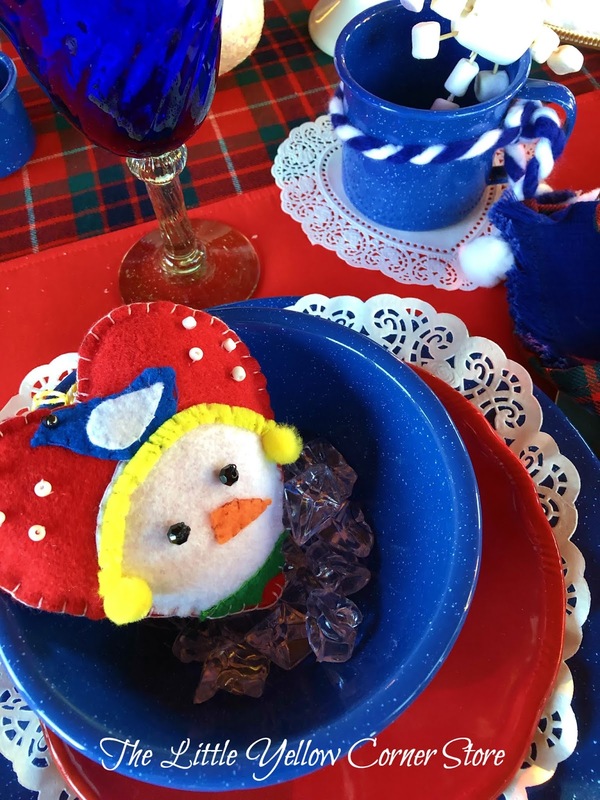 The rich red and blues of your plates and cups against the tartan tablecloth looks so cozy. I want to pull up a chair and enjoy a slice of that crumb cake with some hot cocoa! And I absolutely LOVE the blue mugs. Are they enamelware? Also love that you made the tablecloth and napkins yourself. Have a wonderful Valentines Day, and stay warm! Hi Rebecca, Thank you and you are most welcomed to come for a visit. The blue mugs are enamelware along with the dinner plate and the bowl. So are the little "espresso" mugs that I use as votive holders. I am glad you found it to be a fun and festive table. It is still winter in Wisconsin. Oh, how I would love to be a guest at this precious table! The rich color palette is so pretty. The heart ornaments are adorable, and I love the marshmallow snowflakes. It has been so much fun being on this hop with you! Happy Valentine's Day! Thank you Shannon. It would be great to have you as a guest. More snowflakes and coffee cake.....here we come. Thank you and I enjoy blog hopping with you too. Such a fun Valentine's table! I love how you have used the winter weather for inspiration. Here in Canada, I am in the same boat with the weather!! Those marshmallow snowflakes are so fun (I will be borrowing this idea!!). What a delightful table!So cute and sweet! What an adorable setting! Love the marshmallow snowflakes & felt heart snowmen. Such a cute idea. Mixing winter with Valentines is perfect since it’s soooo cold this year! Happy hoping with you! Thank you Desiree. Still trying to stay warm. A cold enough winter for a lot more hot chocolate and marshmallows. Happy Valentine's Day. Stay warm too. This is so cute! I love this winter-themed Valentine's Day table! It is so cozy and inviting. The marshmallow snowflakes are a perfect detail. 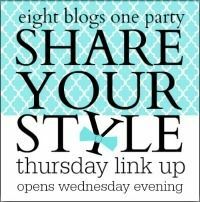 So happy to be on this blog hop with you! Thank you Lynne. I love the snowman theme but the snow is questionable. We are expecting another winter storm. Oh well....more baking and hot chocolate coming up.....! Happy Valentine's Day. I'm never thougt about a snow-themed Valentine's day, it's fun and original! 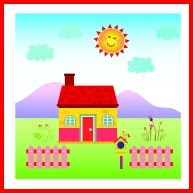 Thank you for sharing, Marsha, it's always inspiring to blog hop with you! Thank you Donna. It is a pleasure to blog hop with you as well. It is not hard to pick a snow-themed Valentine's....especially as we are getting more snow at the moment. Bundle up in Wisconsin is the inspiration. 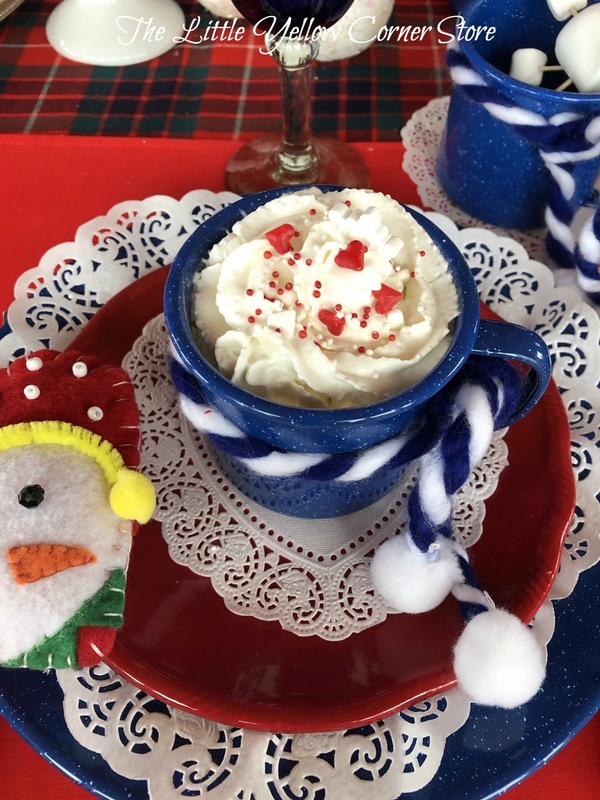 Marsha, what a fun twist on the holiday and you're absolutely right (especially this year), Snowmen definitely have a part to play in Valentine's Day! 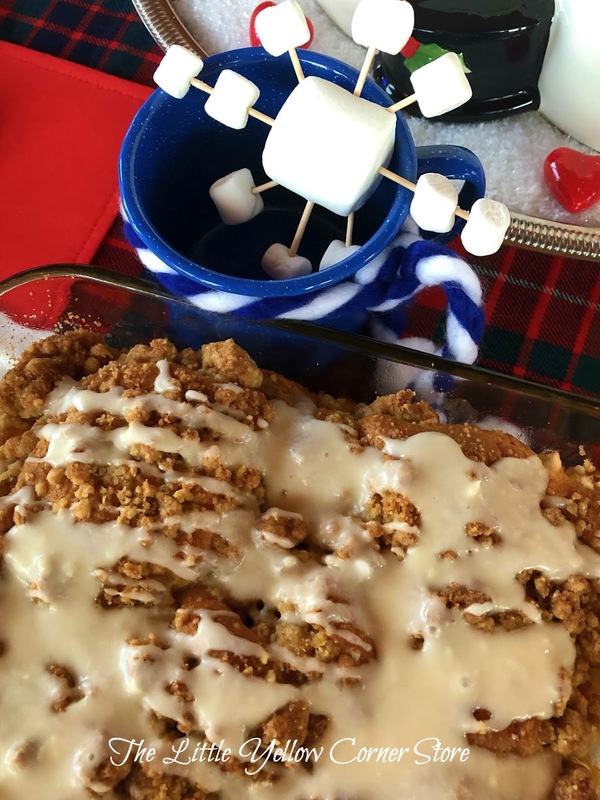 Hot chocolate with those delicious marshmallow snowflakes and a slice of that decadent looking crumb cake sounds like just the thing to warm all of our hearts. Happy Valentine's Day to you! Thank you Kim. We just got thirteen more inches of snow.....more hot chocolate is being made. We will definitely have Valentine's Day with snow and snowmen. Have a great Valentine's Day. This is such a creative tablescape! It works so will since Valentine's Day is a winter holiday. I love your use of plaid, and the blue makes it look so wintry too! So happy to be on this hop with you. Have a Happy Valentine's Day! Thank you Amber. 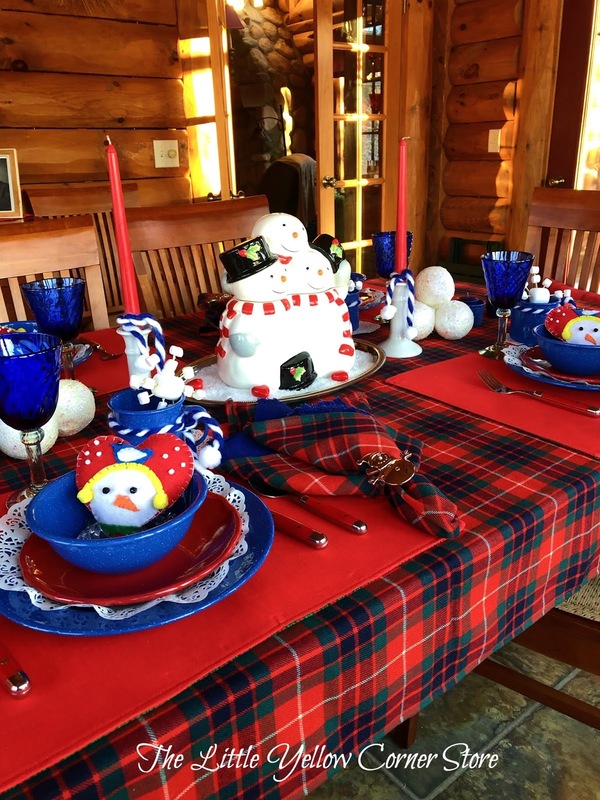 There is something great to be said about plaid and snowmen together. I am glad you enjoyed A Day With Snowmen and Hearts and it is a pleasure blog hopping with you. Happy Valentine's Day. Thank you Miz Helen. I am sure glad I could share some delicious treats.